Starring Boris Karloff, Estelle Winwood, Ed Nelson. Written by Robert Arthur, based on his short stories "When the Dead Talk" and "Calling All Corpses." Boris treats us to two stories dealing with communicating with the dead: the first concerns a morgue attendant (Karloff) who claims he can talk to his tenants. Then a wanted murderer (Nelson) and his wife come back to the old family estate to collect their inheritance. 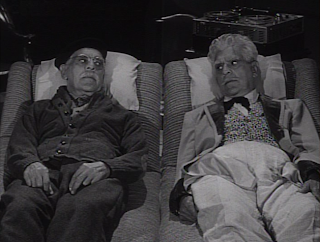 PE: We get both ends of the Karloff spectrum this episode: first, the tender side, in an understated performance as Pop Jenkins, the kindly old man who speaks to and consoles the newly dead, then as the slightly-more-than-daft Colonel Jackson Beauregard Finchess. I don't know about you, but the second Karloff showed in that get-up, I couldn't stop thinking of Christopher Walken as Colonel Angus on Saturday Night Live ("All the girls love Colonel Angus!"). JS: The second segment fortunately had a little more meat on its bones to enjoy. The southern plantation and mausoleum were much more interesting to look at than the drab interior of Karloff's morgue. PE: Karloff steals the show as usual, but Ed Nelson puts in a good five days work in two equally disparate roles. He's the cocky and unfeeling reporter who takes advantage of old Pop Jenkins and then he really gets cooking as Daniel le Jean, the murderer on the run, looking to get rich quick no matter whose tomb he has to raid. JS: I think the real scene stealer was Estelle Winwood as Aunt Emily Jenkins (I thought it was Shelley Duvall. Thanks for clearing that up! -PE). She gives a great performance, and right away you find yourself asking, I wonder who's already dead. Of course, I also felt the segment included the low point as well, Norma Crane as Danny's wife Nell. Sure, she was playing a fish out of water, but her hip-chick shtick fell flat in my book, daddy-o (Easy on the eyes though. -PE). PE: Was it my imagination or was I hearing jungle noises ala Tarzan (ooo-ooo aaaa-aaa) in the scene where Daniel and his wife are heading for the mausoleum? It may have been my neighbors. 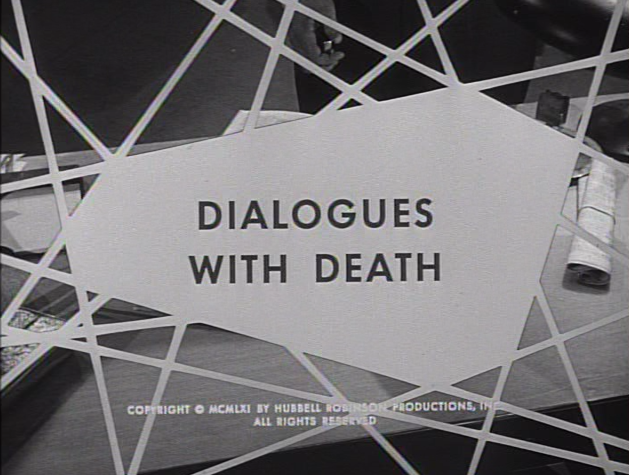 PE: “Dialogues with Death” is based on two short stories by Robert Arthur: “Friend of the Dead” first appeared as by Arthur’s pseudonym Andrew Fell under the original title “When the Dead Talk” in Dime Mystery, June 1949; and “Welcome Home” originally appeared under the title “Calling All Corpses” in Dime Mystery, October 1948. This show is generally ignored and considered a minor entry, yet it delivers a pair of nearly flawless examples of what THRILLER did so well. I thoroughly enjoy the first half BECAUSE of the low-key, chamber-like intimacy of the morgue setting, Karloff's sensitive performance, and the artful design of light and shadow. The hitch-hiker in the road is really well-done, and that brief shot of Ed Nelson climbing out of the ravine, with the fog and light & shadow pattern on the row of road markers, is one of the coolest visuals in the entire series--perhaps the director's subtle indication that Ed has entered the afterlife. When the Thriller guys did actual night photography (which they often did out on the roads overlooking the L.A. area), the effect was fabulous. Part 2 is less my cup-o'-tea, but it's entertaining nonetheless. That claustrophobic, dank, chilly, watery underground set is really terrifying, as is the predicament of the villanous couple. Ed Nelson's "southern accent" is a bit distracting, but not seriously bad. I love when he slaps the old bed and a pound of dust flys up, to which he says "a little dust ain't gonna hurt nobody" (or words to that effect). 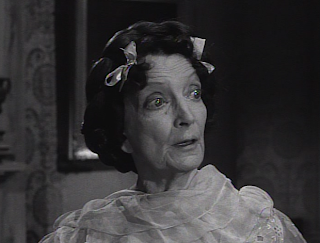 And it's good to see that old goony-bird Estelle Winwood doing what she did so uniquely well. Fine direction by Herschel Daugherty throughout. 8 out of 10 Karloffs. Troll through any issue of WEIRD TALES or comparable pulp mag from the same period, and you'll find the "classic" stories inundated in a morass of genuinely lamentable hack writing. A penny-per-word — or more often, a quarter-of-a-cent-per-word — doesn't buy you brilliance as often as it fills pages fast, which is why the classics are like lightning strikes amid a rainstorm of average stories. Same goes for THRILLER. You need the near-misses, also-rans and outright flatulent failures to define the top skim. As with an anthology, even a "best-of" cull, different readers (or viewers) will define what's good differently according to taste. In this case, everybody has a different ceiling (and floor) for what is unsettling. What I'm finding is that even in the misfired or not-quite-as-good episodes, there is generally something to savor, be it a serving of lovely Old Dark House ambience or one noteworthy performance amidst a gaggle of turkeys. The best THRILLERs are more enjoyable when one has a context in which to judge them, which is why folks who jump right to "Pigeons from Hell" and dismiss everything else are missing out on a bigger — and surprisingly, often-satisfying — picture. Take "Dialogues," for example. Jay Allan Sandford (in his much-cited THRILLER piece for MIDNIGHT MARQUEE) lamented that the first story is "another one of those 'oops, I'm dead' stories." Well, THRILLER didn't have any of those — this is the only one, so it'll serve nicely for covering that overworked aspect of the genre. Check please; next. THRILLER at its best provides the viewer with a sampling of WEIRD TALES TV ... especially instructive for the mooks who will name-drop WEIRD TALES without ever having read any of the, um, weird tales. Unlike most viewers who see the multi-story episodes as pleasing no one or serving too many masters, I think they usefully expand the anthological reach of THRILLER. Imagine if "God Grante That She Lye Stille" and "Closed Cabinet" (for example) had been bi-packed into a similar single episode (just as John suggests expanding "Friend of the Dead" to an hour). They even got around to attempting an all-crime antho-within-the-antho with "The Lethal Ladies" (once again, with the leads essaying dual roles). I think a couple more multi-parters might have enhanced, not diluted, the overall impact of THRILLER, because THRILLER managed them well. NIGHT GALLERY, for contrary example ... not so well. Eight full Karloff domes at least. 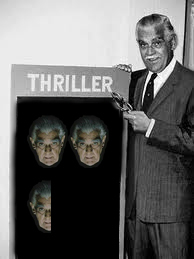 I mean, come on, it's a Kornucopia of Karloff! This was another episode that snuck up on me and left me feeling warm and fuzzy, in a karloffian way. While some have criticized the first story as a trifle, I am going to play the percentages and agree wholeheartedly with my predecessors in saying that the presence of BK made the predictable tale a perfect aperitif. While i'm not familiar with journalists who apply their trade with the same disjointed spirit of decisionmaking by the two members of the press here, every scene with Pop Jenkins glowed with a warmth and believability that rendered the quibbles mute. I agree with Schallert was totally underused, and the twist ending was actually a well-placed detour sign that led to a well-worn conclusion. The second story could have been fleshed out more and been replaced by one of the ol' God-Grante-A-Cabinet storylines. 'Calling All Corpses' may not have had much of a thriller macabre ending, it was suitably gruesome and icky, with a wry twist. 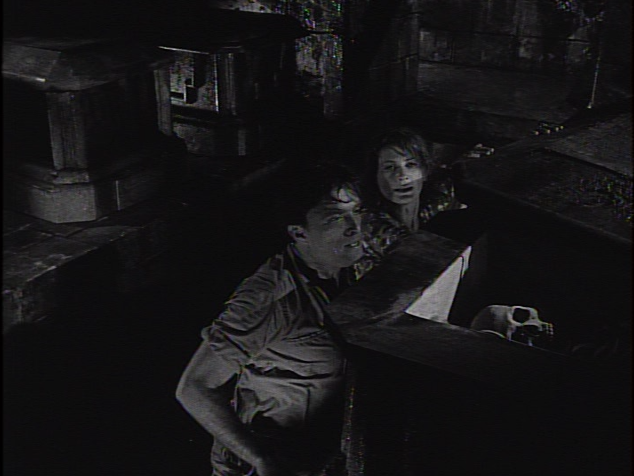 Winwood and Karloff made a fine macabre couple. "Flatulent failures": gotta steal that someday, DJS! And I agree about THRILLER's multi-story episodes; they're enjoyable, tight without feeling rushed, and provide a different emotional sensibility (short stories vs. mini-novels). Like "Trio for Terror," another very respectable three out of four K's for "Dialogues." As long as we're pondering the possibilities of variant episode lengths, let's consider the opposite approach for THE OUTER LIMITS. How about a two-hour version of "The Architects of Fear," so we can at least get to the U.N. and have the bogus Thetan deliver his ultimatum? Alien Alan can still break down at tale's end, but the "spacecraft's off course!" contrivance would be avoided and it might be interesting to give that daring-but-wacky scheme for world peace a fighting chance. my research has shown that the two stories used in 'Dialogues with Death', though printed in pulps, were actually radio-plays from the celebrated 'Mysterious Traveler' show. Bobby, I am a big Robert Arthur fan (he edited and placed his own stories in a lot of YA anthologies I read in the early '70s.) The radio show is a near-forgotten gem. Arthur may have turned some of his radio scripts into short stories and vice versa! Fascinating info, Bobby. Good digging! I have a huge library of old time radio (thousands of shows) but not sure if I have The Mysterious Traveler. Besides co-creating The Mysterious Traveller, Arthur worked on Alfred Hitchcock Presents and several Hitchcock books. And he created, and wrote most of the early entries of, the Alfred Hitchcock and the Three Investigators juvenile series I recall from my childhood. I loved their secret headquarters. I've since gotten a number of them on eBay, joining my heap of other unread books. Dialogues With Death gives us a double shot of Karloff. Sweet! My affection for Mr. Karloff quickly surfaced moments into first act, "When the Dead Talk". This short was relatively subdued and didn't have a monster or such scene stealer. Instead, we got a relatively low key ghost story that allowed Boris, as the mortician, to play to that gentle giant side of his. The whole time there was a touch of lonesome graveyard supernatural that hung in the air and let you know that you were still watching a Thriller episode. The way Boris provided comfort as the caretaker to the beyond was a great tranquilizer to that grim reality of death. Calling all Corpses was wacky fun. Throughout the episode I kept hoping that Boris would divulge the Colonel's secret recipe. I just love that old southern gothic horror settings. The comedic bits reminded me a little of Masquerade. Boris played the light comic foil and wasn't as good as he was during the first short, but Ed Nelson gave the episode legs and the final scenes in the crypt were fried up in an extra creepy batter. As a fan of OTR I appreciate the trivia about the source material...so sad that many episodes of so many of the programs from that time haven`t survived. Totally agree with DJS on this one.After checking the DVD timer on far too many shows I wonder if it would have been better to have alot more double or triple story episodes. At least three Karloffs for his three personas and a largely great supporting cast. No one seems to have addressed the big question: Were Ed Nelson and Norma Crane's characters REALLY already dead? Or did Boris and Estelle do them in by way of their delusion? Or was the delusion a disguise for omniscient justice?? Not a bad episode when viewed on ME TV . Boris comes across as so refined with his great English accent-note his mixed ancestry per Wikipedia--East India blood--the dark skin so to speak? I caught this episode a while ago, liked the first one, which I'd seen before, enjoyed it immensely, and picked up on things I didn't notice the first time around. The second story was a disappointment. I found the ambiance a bit tiresome. Some decent shots of the plantation, okay interior, some nice portraits on the walls, a few cobwebs, the crypt, but it felt like a Laugh-In warmup for Dr. Markesan. Maybe Thriller made one too many excursions into the Deep South. Boris and Estelle were fun to watch but basically miscast. I thought the younger actors were better suited to their roles. They were too obviously doomed from the outset, in a way that the two young men in the first episode weren't, which telegraphed the ending almost from the git. Watchable ep but fair to middlin' in my book. I love this episode, especially the first half, which is simple, gorgeous, and really spooky. Love how Ed Nelson is in both and so different. Not the greatest episode, but still beautiful.